Look, son. I may come off like an old ignorant drunkard to a smart world traveler like yourself. But I’m all up to date on my celebrities. I even keep up with the Kardashians like a good citizen of this twenty-first century, enough to know they’re a bunch of crazy fools. I know the celebrity serial killers too, so I know for gosh darn sure who I saw. Come over here and sit by me, son, and let me by you a drink. I’ll buy you one of whatever it is you’re drinking. I’ll tell you all about Jason and me if you do. Well, thanks for obliging and sitting by old geezer like me while I tell you tales. I’ve been this town forever, son. Since I was yay high. And I have all the local gossip to tell you. But I can tell, you’re all skeptical like that redheaded gal on that X Files spooky show. I know that you are. I recognize that look, son. You think I’m off my rockers now, don’t you, traveling through my parts on your high horse judging us folks here in this little town. Yep, you probably do. I know that look. Seen there, been there. Yep. Well, son, let me tell you this. We here may look like nothing but a bunch of ignorant fools, son, sitting around all day talking story, chewing the fat, horsing around, shooting the shoops, however you like to call it. What are shoops, son? Look, you seem like a smart boy. Just because my generation is full of hippies with LSD induced dementia doesn’t mean I go running around spicing up my dialog with f bombs every other sentence. Even a barfly like me has to have some dignity. Would you prefer I said, ‘blast some defecation on your ears?’ No, of course not. So, shoot the shoops it is. As I was saying. I don’t know how someone in your parts calls sitting around and having real conversation with live people without a doo-hickie computer gadget in your hand like a baby rattle. Don’t care to know either, truth be told. But around here, we know what we say, and say what we mean. Me, I’m no different. And I know what I saw. I’m telling you, I saw him. I saw Jason, and I’m just glad it wasn’t Friday. You understand, son? Son, let me tell you this. We try to stay away from urban legends, just like any other somewhat sane person would. At least, while sober anyways. After a certain hour and several pints, we all kind of become werewolves. Understand? But Jason? Lordy Jesus. Who’d have thunk he’d grace us with the pleasure of his company on such a lovely day, here in our little town? Never thought I’d be seeing any kind of celebrity around here, if you’d asked me before that day. Before I’d seen that boy Jason, I’d have assumed all those overpaid so-called stars were too busy getting drunk in Paris, and hitched and ditched in Las Vegas to be just moseying around here like one of the boys. Never would have thunk it in a million years. No son, I wasn’t exactly going around looking for him. I don’t imagine many people do around these parts, what with all the summer camps and camping grounds and such. That’s going around looking for trouble. And once you get to be my age, son, you know it’s foolish to be going around looking for trouble. Trouble will always find you. Anyone with a sense of ounce, sorry, did I say that? Anyone with an ounce of sense around here knows not to go looking for trouble for just that reason. Ain’t no different with me. Me, I don’t usually hang out at the bar with serial killers, or at least I think I don’t. I guess you never know, though there was that one guy passing through, sort of like you son, that had a funny look to him. Never know with drifters, just never know. They can be a little queer, son. And I don’t mean the kind of queer where boys get all warm and fuzzy on each other, either. Words still mean what they mean now, don’t they? So now about Mr. Jason. Well, see, I was just driving from the bank when I saw him. Taking care of daily life, going about my daily business. See, I’d just noticed that the campground over there was closed for the season when I ran into him. Budget cutbacks, something like that. Rough times all around, it seems. Kids ain’t going to go to camp this year, I guess. Just like Daddy not going to work, men all laying around just like you, son. Hate to sound critical, but what can I say about a world that takes away a man’s right to earn his bread and turns him into a hobo on the dole? I’m just glad son, I’m a man in his twilight times, and not young like you and the boys and those liberated gals. You all youth, you’ll be the ones doing the suffering, the way they ran everything into the ground. Well, well. I’m a bit off on my train there. Your gadget telling you that ‘you’ve got mail’ threw me off kilter. Still not used to these things, boy. No, no. To me, a phone is a phone. Nothing less, nothing more. Don’t need to have the government spying on me anymore than I have to, is my way of thinking. Seems that kind of discretion’s gone the way of cassette tapes and antenna television, see? Anyway, as I was saying, I’d just come from the bank when I saw that boy Jason. When I got a glimpse of the boy I was thinking about a conversation I had with a couple of fellows in the bank, new ones in town. I’m still of the old school that goes inside a bank to chat with real people instead of letting some machine spit money at me. You know that machines like that are the reason why young fellows and gals like are out of work. Just like you, son, right? Why else are you wasting time with me when you could be twatting with your gadget? Sorry, what is it? Tweeting? Right, tweeting. Like a bird who can’t settle down, flitting around with no responsibilities. Got it. My sincerest apologies. From the bottom of my heart. Well, I’m sure you know the banks couldn’t handle themselves. So our lovely wonderful government decides to hand out money to them when it could have being doing something more logical like paying down its debt. Or giving some money to a mom and pop store so boys and gals like you could get a job. Nope, the government, in its vast resources of infinite wisdom, instead decides to hand money to people who not only go broke because they don’t have money, but their express purpose is to work with money. So you hand them the very thing they can’t figure out to sell or manage? Jeez Louise. Well, that’s the government for you, right? No wonder Jason is such a psycho. Even he knew it was all shot to hell, right when he was born. Right? You can expect that the banking industry’s fiascos came up somewhat in conversation when I spoke to the boys in the bank, especially given that this branch of the bank itself was busy doing renovations. I say to the boys standing in line, well, doesn’t it seem strange that with the banks going out of commission, they’ve got enough money here to put fancy desks into the joint? Which was exactly what they were doing, mind you. So the girl teller says to me, that it’s because they needed to upgrade the facilities for the handicapped people and that they had the money a long, long time ago expressly for this purpose. I see the desks, and they’re all looking like the same desks except they’re nothing but newer. Seems like the boys in line saw the same thing, because they say to the girl teller, how does upgrading the desks make it easier for the handy-capable? That’s the word they used, handy-capable. Son of a gun, what they do with the English language nowadays between the techno boys and the political correctness police. What’s that new word now? Yalo? No? Oh, yolo. Right. Yolo. Geezer me, can’t keep up with all these initial-words. Now you need initials to remind you that you’re dropping dead one day. Just what everyone needed. And so I got to talking to them boys in the bank, as I don’t recall seeing them before. They were saying there was a job fair that they were heading out to. The two boys had just moved into the area, looking for jobs as nurse’s aides at the job fair at the hotel downtown. When they said what kind of jobs they were looking for, I couldn’t believe my ears. I asked them, “Nurses what? Nurses have aides now?” And then they tell me that they do, which I can’t believe. You ever hear of nurse’s aides, son? Yes? Well, to me it’s a fancy name for orderlies demoted to candy stripers. And it seemed strange that two boys were going out of their way, looking for work like this. Yes, yes. I know. I know everyone does all kinds of work nowadays because the economy’s all shot to hell. But I don’t have to tell you, well maybe I do as you’re a young person, that it wasn’t so long ago that nurses were gals and men were orderlies, that was that, no silly politically correct hybrids needed. So the men told me they were from a couple of towns over, squeezed out of work by their assembly plant going all Mr. Roboto, and they had found out that the job fair was advertising some crash course to get your degree in cleaning out bedpans. Can you believe it? The boys had run some overdraft on their checks for the course, and that’s why they were at the bank sorting it all out. The looks on their faces, that’s what I was thinking about as I was driving away from the bank and just before I ran into Jason by the summer camp. I was thinking how glad that my working days were over and that I’d gotten out just in the nick of time, a nice pension to cover me and a house that had no debt overhanging my head. Rough times for so many, right? Like you? This is what got me to thinking as I drove away from the bank, right past that very summer camp that got shut down. Have you ever been to summer camp, son? Yes? I haven’t, and haven’t had a bad life because of it. But that was back when people seemed to know what to do with their hands and their time, and it was safe to walk the streets without some maniac threatening to do one harm. Sort of like the Jason fellow. And what do you know, son? Just as I drove past the summer camp, I saw a fellow in a very old car driving from it. He pulled out of the driveway, the one that had a big gate in front of it saying, “Closed Until Further Notice”. That is, that’s what it said initially before all the kids got around to defacing it. You know that scribble that city fellows like you spray paint all over bridges and buildings? Well, it was like that. Maybe given the state of the world, I should feel grateful that the kids were outdoors in the clean, fresh air rather than playing E-Farm or whatever the rage is nowadays. But son, I do have to hold the line at turning into graffiti bombers. You agree, right? Sure you do. Well, there I go off my rocker again. Retirement does this to a person, my boy! Which is why fellows like you need to stay busy and productive. Make a real honest living, and don’t get yourself all slovenly hanging out in bars all day throwing your life away. Anyway, as I was saying. I was right at that graffitied sign, just about to get a glimpse to see what the new nonsense was on it, when I saw Jason make his way straight from that closed camp. I know it was him. I recognized him just from that hockey mask. No, I never spent any of my hard earned money watching any of his ridiculous antics. So how do I know about Jason, you ask me son? Well, how could I not? I’ve been so blasted by decades of lousy advertisements about this Jason fellow wreaking terror in small towns like mine, and everyone spending their parents’ hard earned money to see him slice dice and splice unsuspecting kids wearing his hockey mask trademark to scare the heck out of their lady friends on date night. So I’ve seen enough, boy, to know that it was Jason. And I never saw the boy before in my life, at least live and in the flesh, so I know the boy was passing through. Like you, son. With that gate and all, I’m not exactly sure where it was that Jason intended to go. Maybe being that he’s supposedly part of the undead, he didn’t get the news bulletin that this particular killing field was out of commission for the season. I don’t know how often zombies go and traverse the Internet. Don’t care to know, either. But I saw Jason turn around there, and I knew it was him, what with his hockey mask and all. He drove a really out of style old car, a relic from the eighties. Awfully fitting, seeing that this Jason boy is a somewhat out of style relic from the eighties himself. Agree? That’s why they recycle him, trying to make him into something else? What do they call that now, the three R’s? Recycle, reduce, reuse? Truth be told, it’s actually an improvement on the old school three R’s. At least the darn words actually start with r’s. How do you expect anyone learn math and writing when you go off and spell the words wrong? What the heck is rithmetic? No wonder China’s hammering our butts. Jeez Louise. Anyways. Back to Jason and his trip to the camping ground. Once I saw the boy turn around with his old jalopy bomb, he made a turn towards downtown, where the bank was and where the hotel with the job convention was. I only saw him for a moment, and he was gone. Just enough for me to say, I think I seen me a celebrity ghost. I wasn’t even drunk yet, so I knew what I saw. Sober as a newborn baby I was when I spotted Jason whisk past me towards town. I think as I see him disappear towards town, boy, what a story I have to tell! Something other than old Reverend Hawkins drinking the communion wine, once again! My guess about what that Jason boy was doing, if I could indulge you in offering one? I think that Jason boy was just like the boys I met in the bank. Yes, I do. For one, I saw the edges of Jason’s face when he passed right me, wearing that hockey mask. He was covered in ink. On his face and his arms. Yes sirree. The boy had more artwork on his face and arms than the Sistine Chapel. That’s a new disguise for him, son. I looked it up on Google. Mr. Jason once had a really disfigured face after someone tried to take him out and failed with some kind of acid attack. Hard to kill the undead, I guess. But it looks someone gave it a good try with all that crispy falling off skin. You ever get yourself burned son? No? Good. Keep out of trouble and don’t wind up like this Jason boy. Getting yourself burned up, don’t matter whether it’s fire or acid, that’s one nasty way to go. So after that experience, I suppose Mr. Jason went and got the tats the better to help him get a job what with to cover up his disfigurement. Tats aren’t the best getup for an interview, in my old school opinion. But it’s a heck of a lot better than showing up with a burned off face, don’t you think? And apparently he was none too handsome to begin with, what with all his facial deformities and the like, just like when those nasty counselors let him drown way back in the days of 8 track tapes and Atari computers. He’d never get a job, looking like he did naturally. Even nowadays, with everyone with their ten million friends on Facebook and their political correctness. This we-are-family neo-hippie love is all smoke and mirrors, and no more real than planting some digital farm with someone in Bangladesh you’d laugh at if you really met for real. Yes, son. You know what I’m saying. Don’t you, now. Everyone is all trying to pretend that they’re being nice to different people with these biking and running things that they have on TV to raise money for all kinds of deformed and maimed people. But when actually confronted with a disfigured person? They’ll throw up and then hide in their I-Pineapples and hope they just had a bad dream. It’s a good thing to remember, son. In case you get the idea that you can drive off after sitting with me, you don’t want to crash up and look like Mr. Jason did after that acid attack. You ain’t never going to get the ladies or a job after that, if you make a dumb decision like that. Look at that poor Jason fellow. He’s getting downsized by those C things. Whatchamcallit, oh yeah. CG. Computer graphics. See? I’m not so ignorant for an old country bumpkin, right? Do you know, son, that Jason’s last name is Voorhees? A nice Dutch name, just like Rip Van Winkle. And we all know the legends that boy generated, just like Mr. Jason. Makes me want to drink a nice Dutch lager in celebration. Would you like one, son? Of course you do. Drink in celebration of urban legends that never die? Some things in the world just don’t change son, even in the face of I-Pineapples and all the such. So who knows what Jason was planning on doing that day I chanced by him? I saw him that once, and chatted up a couple of other people claimed to see him that day. He didn’t go and rob the bank with the new desks, though it was of some people’s sentiment that they wouldn’t blame him if he had. A downsized and shifting economy makes people not particularly merciful, son. You of all people should know that, sitting on your bum letting me chew off your ear instead of working. Some whom I spoke to thought Mr. Jason was thinking of going to the job convention. After all, a lot of men and women were going there looking for whatever crumb they could get. But I have a different theory, son. Maybe Mr. Jason wanted to change things up a bit. Like in his last movie, I think he used his hockey mask and some burlap sack from one of his original movies, like he was trying to change up his style. At least, according to my investigative reports on the good old Web. And one thing I know is that in this world, son? You got to keep updating your skills. Be visible, like go on these sites where you constantly have to tell everybody about every sniffle and snooze and snore you make. I’m glad I got out when I can, but those like you and Jason got to change it up and become new every day. So my theory? Maybe Jason really went to that camp to start up a new chapter. Put some blood into his franchise, and go a little different from his twentieth century counterparts. I mean, son, they are redoing Superman, Batman, Spider Man. They do exact remakes of Total Recall. They’ve even got Halloween all replicated and that Freddy guy who pops up in everyone’s dreams acting like he sat on a Xerox. Son, I think they’re taking all this green stuff a little too far. I mean, I’m all into recycling. But recycling exact clones of movies already made? No wonder this country is outsourcing all the work leaving you without a job. This country has outsourced its little pea-brain mind. Maybe it’s all the rithmetic. So maybe, Jason was trying to reinvent himself, coming to my town on Thursday the 13th. He’s done a few times before according to what all the fans say, traveled to reinvent himself. Traveled to space, made a campfire in Hell, duked it out with the Freddy dude from everyone’s dreams, and now he’s popped up in my hometown. Don’t want to be predictable in the world now, do we? Except the boy, being an outsider like you, just didn’t know how bad the economy was, and that he was out of luck in finding a new set of boys and girls to ax off because the camp was all closed down. What do you think, son? 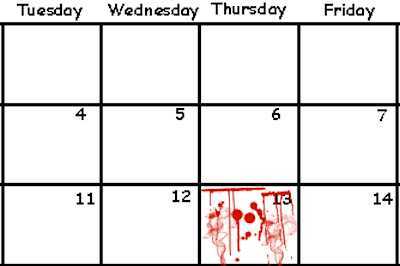 Thursday the 13th instead of Friday the 13th? Why not, right? Hey, son. They’ll have another job fair next month at the hotel. Seeing that you’re out of work and have nothing better to do, why don’t you stick around so I can chew your ear off a little more. You can even stay in my place, a little cabin outside of town. Then you can go to the job fair. Say you know what son? It just occurred to me that the job fair next month is going to be on the 13th, a Thursday! Just like last time, when I saw Jason. Say, who knows, maybe Jason will be there, looking for some extras on the side? What do you think, son? Because you never know what for sure what characters you will meet, do you now? Thanks for your visit, and feel free to stop by again.